Top half of stone, the part above the girdle. Bottom half of stone, the part below the girdle. The line dividing the top from bottom. Large facet on the top of the stone. One way to define the main is to say that it is the facet cut a the culet angle, and other pavilion facets will be cut at angles +/- this set. On some stones the culet MAIN is the facet that terminates at the culet. Another thought, its simple one name for a facet that aids in differentiating it from others when creating a faceting (cutting) diagram. Same as MAIN in pavilion only it is in the Crown. Also usually the facet that the start angle is cut from. All other calculated from it. Facets found on each side of the MAINs, usually 2 times as many as the mains. They usually begin at the girdle and move toward the top or bottom of the stone depending on their type. Facets around the edge of the table that also contact the MAINs. The angle at which the majority of light is reflected back into the stone. Cutting below this angle produces a "window effect" and there is more light lost than reflected back. The angle that the MAIN CULET facet will be cut, and the angle used to calculate the other culet facets. These angles are not constants, rather they are guides. Starting pints from which to work. They should always be greater than the Critical Angle. The angle that the MAIN CROWN facets will be cut and the angle used to calculate the other crown facets. These angles are not constants, rather they are guides. Starting pints from which to work. They should always be greater than the Critical Angle. The rod or stick to which the rough material is affixed before beginning faceting. The DOP is used to control the rough material while it is being converted to a cut stone. The index gear is used to determine the placement of facets around the stone. It is used to define the symmetry of the stone. The gear has teeth cut around the edge and they are used to align and fix the gear in set positions. 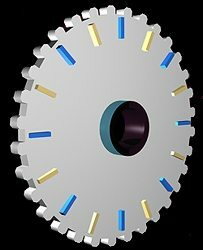 Illustrated is a 32 tooth gear and it can cut any symmetry that is evenly divided into 32. Hence you can cut 4 side stones, 8 sided stones, and 16 or 32 sided stones. It cannot be used to cut 3, 5, or 6 sided stone as none of these is evenly divisible into 32.